Andaman and Nicobar Islands (/ˈændəmən/ & /ˈnɪkəbɑr/; About this sound local (help·info)) are a group of islands at the juncture of the Bay of Bengal and Andaman Sea, and are a Union Territory of India. The territory is 150 km (93 mi) north of Aceh in Indonesia and separated from Thailand and Myanmar (Burma) by the Andaman Sea. It comprises two island groups, the Andaman Islands and the Nicobar Islands, separated by the 10°N parallel, with the Andamans to the north of this latitude, and the Nicobars to the south. The Andaman Sea lies to the east and the Bay of Bengal to the west. 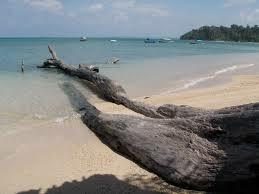 The territory's capital is the Andamanese town of Port Blair. The total land area of the territory is approximately 8,073 km2 (3,117 sq mi). The capital of Nicobar Islands is Car Nicobar. The islands host the Andaman and Nicobar Command, the only tri-service geographical command of the Indian Armed Forces. The Andaman Islands are home to the only known Paleolithic people, the Sentinelese people, who have no contact with any other people. The earliest archaeological evidence yet documented goes back some 2,200 years. However, genetic and cultural studies suggest that the indigenous Andamanese people may have been isolated from other populations since some time during the Middle Paleolithic, which ended 30,000 years ago. Since that time, the Andamanese have diversified into distinct linguistic, cultural and territorial groups.